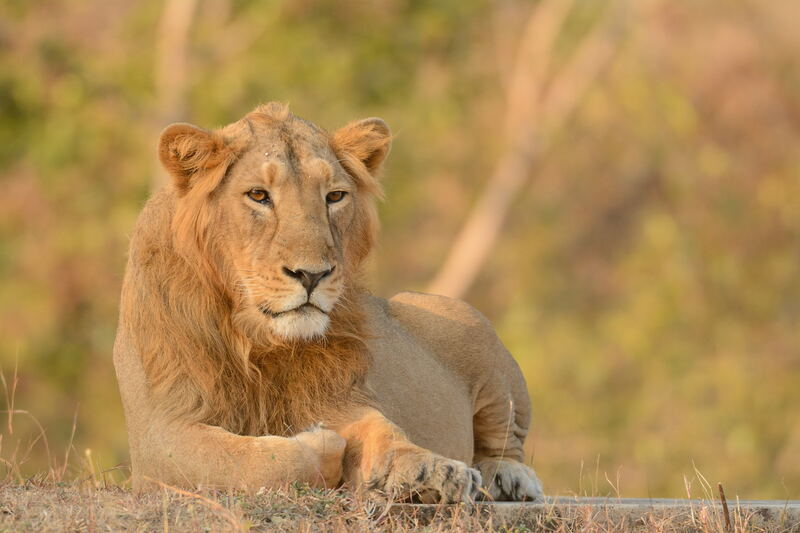 We had never seen the Asiatic Lion and the trip to Gir that we had planned for the last week of 2014 was for exactly that reason. My interest in wildlife, however, till this point was mainly restricted to the incredibly diverse world of birds. I have always felt that with birds you are never disappointed and any birding trip would result in a few lifers and some new learning. So, it was with these thoughts that we made the drive from Ahmedabad airport to Sasan Gir. Gir is a great place to spot other mammals like the Indian Leopard, Striped Hyena, Golden Jackal, Chital, Nilgai, Sambhar, Chinkara and Wild Boar. And is a good birding place as well – home to over 200 species of birds. Some of the typical species that could be spotted include Painted Sandgrouse, Paradise Flycatcher, Black-naped Monarch, Eurasian Thick-knee, Long-billed Vulture, Red-headed Vulture, and several raptors including Bonelli’s Eagle, Steppe Eagle, Crested Serpent Eagle, White-eyed Buzzard and Crested Hawk Eagle. 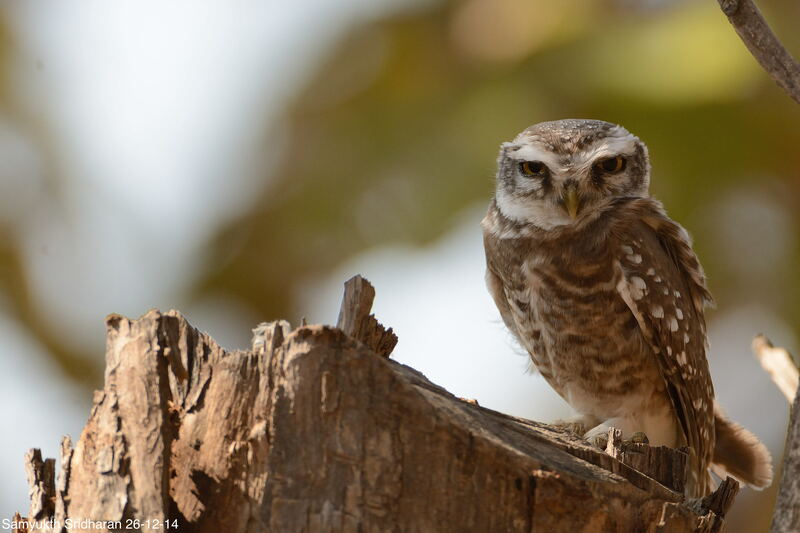 Also seen are Brown Fish Owl, Eurasian Eagle-owl, Mottled Wood Owl and keen eyes can spot nightjars in the late evenings. For this trip I was carrying a Nikon 200-400 f/4 lens mounted on a Nikon D7100 body while my daughter was going to use a Tamron 150-600 f/5.0-6.3 lens mounted on a Nikon D7000 body. She was very excited about having a camera all to herself and not having to share one with me and fight over. And I was excited about teaching her some nuances of exposure, compensation and composition. Each of the 7 safaris that we took were very productive. While that sounds as if we were very lucky, I understood that it is much easier to spot the Lion on a Gir Safari than it is with tigers in any of the tiger sanctuaries in the country. This probably has to do with the population of lions in the area and the fact that Lions here are far more comfortable with human contact given the long history behind this. Our first safari was at 6:00 am in Zone 1 and we quickly realized that in the winters this was a bit too early for photography. So we spent a better part of 90 mins driving around the zone and just getting acclimatized to the forest, chatting up with our guide and soaking in information about the forest and the diversity of life in Gir. An interesting learning was that the indigenous tribe still lives within the sanctuary as they have for the last 300 or so years. At the 2 hour mark, just as we were getting a little worried about not having come across any lions, we suddenly came across a pair of brothers sitting on a raised ground. Now I am a sucker for getting eye-level shots and usually, in safaris, such occasions are rare because one is tied-down to the vehicle. Obviously, we decided to spend some time around these two magnificent young male lions clicking away to our hearts content. The light, background and the subjects were perfect – what more could one ask for on the first safari. Our guide seemed very enthusiastic and knowledgeable about birds. We had a chat with him and arranged that he would accompany us on all our other safaris as well. This would make life easier as the guide would exactly know what we had already seen and that would make it easier for him to decide the zones to visit and specific sightings to look for. 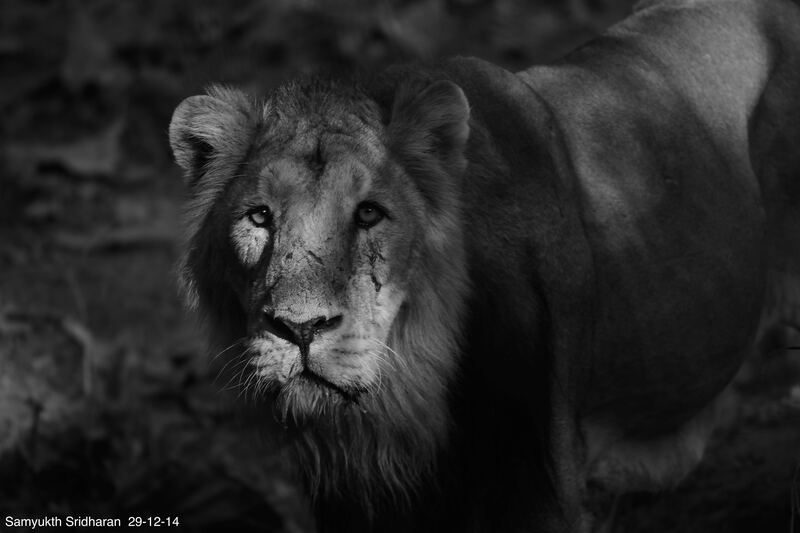 When the guide realized that it was not just the lion that we had come to Gir for, the opportunities opened up. Having got the ideal photo opportunity on the first safari itself meant that we could be more relaxed and afford to be more specific for the rest of our safaris. Of course, a safari vehicle is restrictive when it comes to bird photography since one can’t really get closer to the subject. It was, therefore, important to figure out other birding sites around Gir and our hotel so that I could add to my bird count as well. And I was lucky that there were uite a few birding trails around Lion Safari Camp where we were staying. Lion Safari Camp has some good naturalists and we set up some walks on the birding trails for each day. One of them who was extremely knowledgeable about the birds in the area spoke about the Painted Sandgrouse, Savannah Nightjar and the Stolikza’s Bushchat being spotted in the vicinity and we spent the better part of the next couple of mornings looking for them. 7 safaris and several bird-walks over our 5-day trip meant that we would be going back home with thousands of images and countless memories. My daughter had some perfectly composed images and I came back with some nice images of the Asiatic Lion and of 43 birds including 10 lifers (Yellow Bittern, Short-toed Snake Eagle, Crested Hawk Eagle, Painted Sandgrouse, Brown Fish Owl, Savanna Nightjar, Yellow-crowned Woodpecker, Common Iora, Spangled Drongo & the Stolickza’s Bushchat). Accommodation : Sasan Gir has an extremely wide choice of accommodation options to suit any budget range. So it is important to research the available options well and decide what will work for you. Working in the online travel space, like I do, is a great advantage in helping me quickly zero-in on what works for us as a family. But generally, spending a few hours online exploring options before making up ones mind is very helpful. We had picked the Lion Safari Camp because we were looking for a place that was a little secluded, different from the typical concrete resort and had knowledgeable guides (who came highly recommended as well). Getting there : Rajkot is the nearest airport but has limited connectivity and only to Mumbai. Ahmedabad is probably the best option with flights from several cities in India. The drive to Sasan Gir from Ahmedabad would take you about 7 hours. The roads are generally good barring a 20 km stretch between Junagadh and Sasan Gir. The other option would be to take the train and the best connected nearest station would be either Rajkot, Junagarh or Veraval. Safari booking – The Gir Lion Sanctuary has an online booking system for the safaris (girlion.in is the official site for online bookings). And I understood during my trip that there are about 25 morning and evening safari passes that are opened up for online booking 3-months in advance – that make up 50% of the total daily passes. Last minute passes are available at their counters – and for these one would have to stand over-night in a long queue. So, ensuring that you plan your trip to Gir keeping this in mind is critical to avoid disappointments and the expensive last-minute tout booking. We had booked the morning and evening safari for every day that we were planning to spend there. And that gave us a lot of freedom on how we approach the safaris and the choice of the zones. A detailed , well researched and well written blog that gives useful information for anyone planning a trip to Gir.